Here we swap Christmas cards and a little surprise for your partner. 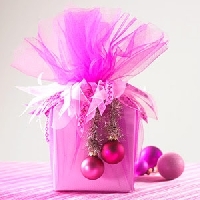 You will have one partner and you will make a Pink Christmascard to him/her and include to your swap a little Christmas surprise to them. It can be a profile surprise or Christmas themed surprise. Pink would be a good color choise for the surprise but not necessary. Write a nice Christmas greeting to your partner's card. Gift is senders choise!! Happy Christmas and happy swapping! Put it on watch for now but I hope to be back. Is this for an ATC sized card or is senders choice in size? Can it just be a nice pink surprise? Yes it can. The gift is senders choise. Of course something Christmas themed would be nice but this is also a pink swap :) So surprise gift and card for your partner. Sorry, I just have to write on a post-it in my handmade card so that my partner has the option of re-gifting it. I hope that is okay. I've taken a good bit of time and money to make very pretty cards and I want them to have that option. Then the joy is spread even farther. Cheers, LPV Please say yes or no to this in this comment section. Yes I think that's fine. As long as you send a surprise gift + card and write some greetings! I'm really worried about the 3.6 person and the 2 non-rated people on the participant list. I'm really hoping this is a quality and flake free swap. I've worked on my packages for at least a month now and look forward to having swappers who put their all into their swaps. I'm sorry, I'm concerned and I just had to vent. Sigh. Everyone has to have at least rating of 4.9 and I will read non-rated person's profiles and decide... I'm really trying to make this flaker free!